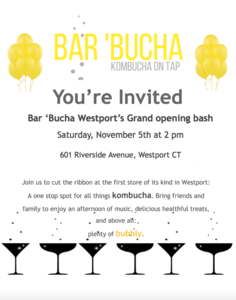 Special Grand Opening of Bar 'Bucha tomorrow, Saturday, November 5 at 2pm. Teen entrepreneur and New Chamber member Aishah Avdiu of Staples High School unveils Bar 'Bucha to the Fairfield County community. Bar 'Bucha is a specialty store offering curated Kombucha on tap and by the bottle to the greater Fairfield County community. This new local business offers the elixir of kombucha, an ancient tea rich in probiotics and antioxidants, in the form of "mocktails", via taps, and by the bottle. All brands are curated from microbreweries nationwide who have mastered the art of kombucha. This Saturday, Bar 'Bucha cuts its ribbon at a festive celebration. Come on out, you will be totally impressed by this young lady.